Successfully Added Digital Video Camcorder Pen - 4GB to your Shopping Cart. Surveillance style pen containing a micro sized video camcorder with 4 GB of memory. Get the mission completed with this awesome secret agent DV pen, often called a " pen" in the trade. Sitting in your shirt pocket, standing in the pen cup or lying on the desk, no-one will ever notice as you secretly capture their every move. The built in flash stores the video until it is ready to be downloaded to a computer via USB, and with 4GB's of memory you can record hours of surveillance or interviews in between trips back to the office. The color video is encoded on the fly through a buffer system to a avi video file, and if the battery runs low during a recording session the pen will ensure it writes the video from the buffer to flash before shutting down. You can also use the device as a flash drive to transport important files around safely. The pen itself is an attractive writing instrument with a gloss black finish on the main body, with easy grip design and chrome detailing. Buy today at Chinavasion's excellent wholesale prices and use our drop shipping service to get it straight to your store or customers doors quickly with no hassle. 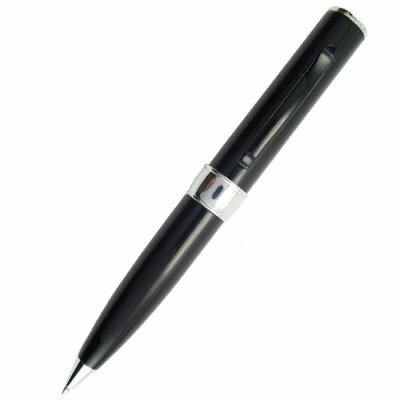 DV Camcorder Pen - for covert surveillance or just having some fun. avi file encoding on-the-fly, no need for complicated file conversion or the like. Simply plug the pen into your computer and transfer the files to your computer to watch your recorded videos. This device is overwhelming, I couldn’t believe the output and quality of recording/audio. It’s just too good to be factual! Highly recommend, give it a shot folks! l am very glad for this type of technology.It is a good product keep it up. on 2009-08-15 23:30:18 Sound okay on mine. i saw comments above on the sound. All I can say is that the sound recorded on mine was fine, reasonable volume and clarity. on 2009-08-15 23:28:08 Excellent value for money. I was amazed at the quality of the video produced by the Spycam. It really is 640x480. These pinhole type cameras usually produce pretty poor video, but this was really good. Another suprise was that the audio produced was good as well. After a full charge I managed to record about an hour and a half of video and sound. Quite good in low light as well. One word of warning, the webcam function appeared to be 320x240, so dont expect too much for video conferencing.